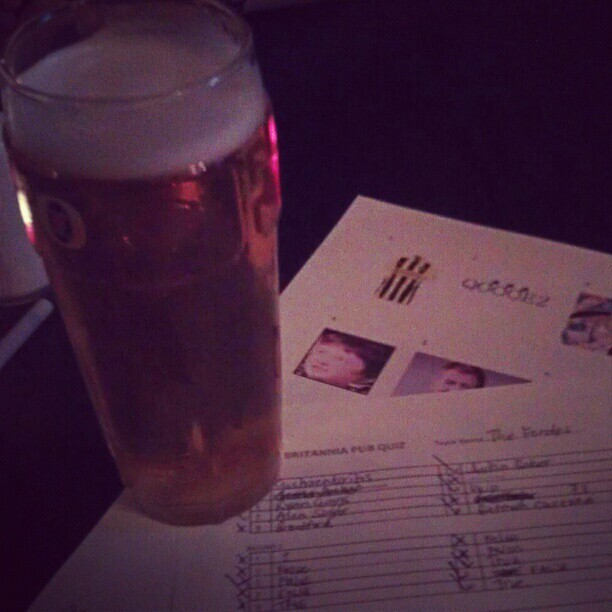 Enjoying my first-ever pub quiz at The Britannia. It’s funny how something as simple as beautiful spring weather can transpire into a whole chain of events. Yesterday, the weather in the South of England was amazing. Highs were just over 60ºF, the sun was shining, and people seemed in a happier mood than usual. Darren came home from work and remarked how nice it was outside, and I suggested we take a walk after we had dinner. So, around 7:30 p.m., we stepped out of the building, walked along the road until we were at the spot were we like to commence our walks along the River Thames. It was dark, and regardless of the lovely temperatures, even at that time of night, there weren’t many people out. We were nearly to the Richmond Bridge when I spotted a phone and pair of sunglasses that had been left unattended on a bench. I picked it up and asked Darren what he thought I should do; it was a nice-looking phone, and I was certain someone would be looking for it. As luck would have it, the phone started ringing. I didn’t pick it up at first, just in case it was a friend of the phone’s owner (or worse yet, a female partner wondering why some American woman was answering his phone!). The person called again, and since number was the same as the one who’d called just seconds earlier, I figured this may be the owner. I answered, “Hello? Yeah, I just found this phone near the Richmond Riverside, are you the owner?” He confirmed he’d lost his phone, and said he’d noticed his phone was missing after he’d boarded a bus heading out of town. Arrangning a meeting place wasn’t too difficult–I suggested he just come back to Richmond and I’d meet him at the bus stop in the center. Unfortunately, he’d gone quite far before he’d noticed the phone was missing, and said he’d be at least 15 minutes. OK, no problem. Darren and I started walking in the direction of the bus stop, and I was thinking it would be nice to have a pint if there was a pub nearby. Enter, The Britannia. This is a lovely, small pub tucked just off the high street on Brewer’s Lane–one of several small cul de sacs that branch off the high street. We’d been before for food, which was great, but hadn’t been in for several months. We got our beers, sat down, and only a few moments later, someone came round asking if we’d like to do the pub quiz. Since it was free, and we had time to kill, we were happy to play. This was the first time I’d taken part in a pub quiz. I know what you’re thinking– “you’ve lived in the UK for three years and this is the first time you’ve done a pub quiz?” Yes, it’s true. I don’t go out all that often, and when we do go out, it isn’t usually on the days of pub quizzes. I had loads of fun answering the questions. We were lucky to catch a bit of the news just before we left for the walk, as there were some questions relating to current events (Justin Beiber’s late apperance for his recent London show), and I really shined when there was a four-question section on American sitcoms. Unfortunately, we totally bombed the picture questions, the true/false, and song lyric rounds. All told, however, we did pretty well for only being a team of two. Between rounds four and five, the guy who lost his phone dropped by, so I stepped out for a minute to return it, and the sunglasses. He was grateful I’d not run off with his phone, and I was happy that he was reunited with it. If we didn’t have such a lovely day yesterday, who knows if he would have gotten his phone back? I certainly know I wouldn’t have had such a great evening.